As we get older it becomes more important to look after all aspects of our health. 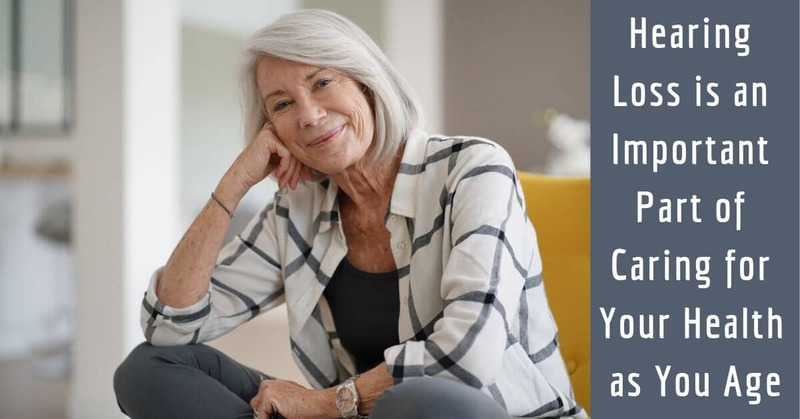 When you were in your 20s, skipping a doctor’s appointment and waiting for your immune system to take care of the problem seemed to be a good strategy, but as you age, it’s important to stay on top of your health, visit the doctor for regular checkups, and perform annual vision tests, cancer screenings, and blood pressure tests. Another important piece of overall health is taking the time to look after your hearing health. Whether we like it or not, our bodies never stop aging. You’ve probably experienced a decrease in strength and stamina, struggled to remember small details, or are living with a chronic illness like diabetes or cardiovascular disease. As our bodies age we also struggle with changes in our eye sight and hearing. These changes occur naturally, but that doesn’t mean we have to allow them to take over our lives. If you have poor eyesight or high blood pressure, you wear glasses or take blood pressure medication. Hearing loss should be the same, and even though these are all normal parts of aging, we need to do our part in caring for our bodies, staying active and healthy, and enjoying life to the fullest. Some of the factors of aging are affected by genetics, but many are in our control. There are things we can do to stay healthy for longer, and slow the aging process to maintain a high quality of life. Rest: To stay healthy, make sure you’re resting enough. You should be sleeping between 7 and 9 hours per night, and getting adequate rest will allow your body and mind the time to recharge. If you’re not sleeping enough at night, take a short nap in the afternoon to make sure you have all the energy you need. Look after your eyes: If you have any vision problems, be sure to get regular eye exams so that you’ll be up to date one your prescriptions. Seeing clearly will keep you healthy, and help you stay young and active as you age. Exercise: Regular exercise will keep you healthy as you age. Try to have at least 30 minutes of activity a few times a week. This could be something as simple at taking the dog for a walk, or walking to the coffee shop rather than driving. You can even do sitting exercises to stay mobile. If you have arthritis, or any other aches and pains, visit your doctor as soon as possible. Leaving these conditions untreated will affect your mobility, and age you very quickly. Eat: It’s important to eat a balanced diet, with lots of nutritious foods. Avoid junk food, or sugary foods and beverages, and work to maintain a healthy weight. Do you have hearing loss? If you’ve been struggling to hear, you need to look after your hearing health as soon as possible. Treating your hearing loss is an important part of caring for your health as you age. Whether you have hearing loss due to exposure to loud noises, or from age related hearing loss, living with untreated hearing loss will lead to a host of negative health effects, and you’ll seem older than you are. If you’re living with untreated hearing loss, you’ll find yourself asking family and friends to repeat themselves often, or you might decide to just smile and nod along, and hope they don’t realize you can’t follow what’s been said. Struggling to communicate will lead to a lot of barriers, broken relationships, and social isolation. Hearing loss is also closely linked to stress, anxiety, and depression, so treating hearing loss is an extremely important part of looking after your health as you age. If you’ve been struggling to hear, visit us today at My Hearing Centers to find out what quality hearing devices can do for you. We’re perform a comprehensive hearing test so you’ll know exactly what sounds you’re missing, and then we’ll work together to find the perfect device that can effortlessly match both your hearing needs and your lifestyle. You can do the right thing for your health, stay active and young, and enjoy clear hearing.